Let's face it, girls love pillows! I cherish a comfy, cozy home, and fewer things can render that better than fluffy down cushions in great fabric. I learned this from my mom. 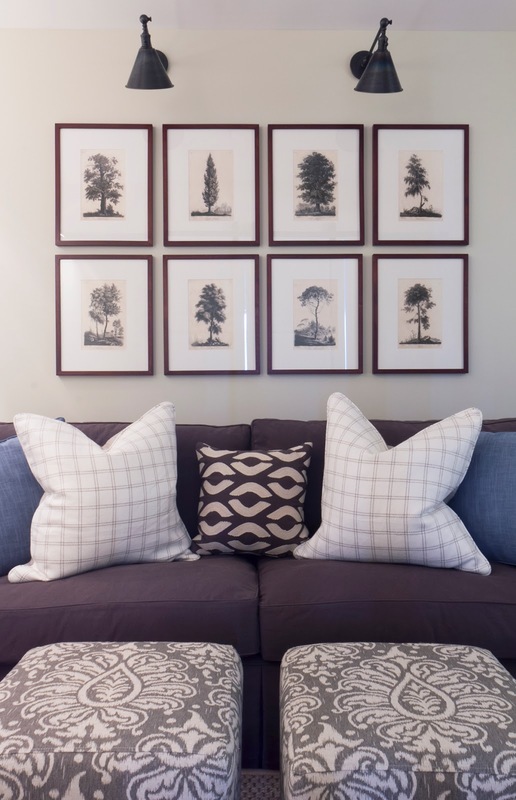 One of the easiest, quickest ways to revive a space is to change out the throw pillows. b) grown up around them so they could hardly imagine life otherwise. 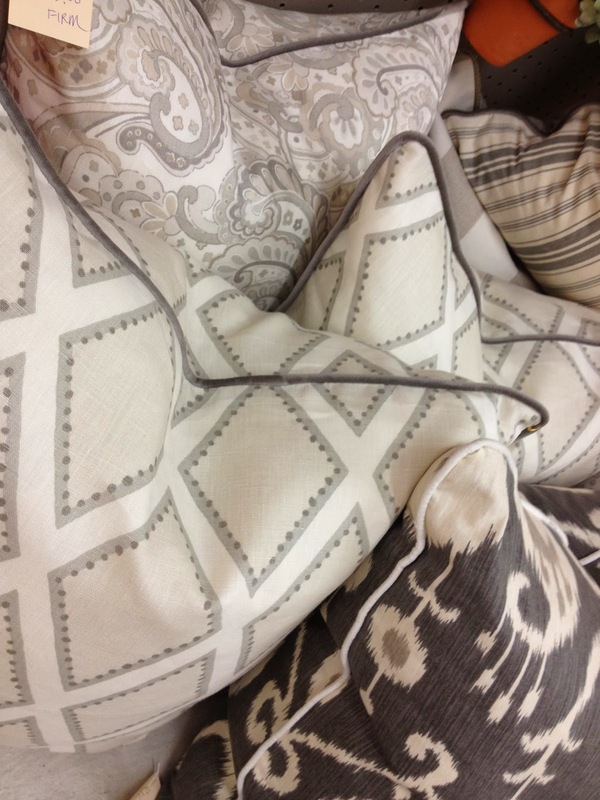 I like to mix patterns and textures, like the above assortment in our guest room. There will always be a stripe in the mix (in fact, my daughter has labeled me a stripe-aholic), and some yummy texture. A little bit of bling is always fun too. I also like to mix high end with low end price points. The above check pillows are vintage, the passion flower and stripes are custom, the Mongolian lamb is from Home Goods, and the gold circle pillow is from Target. 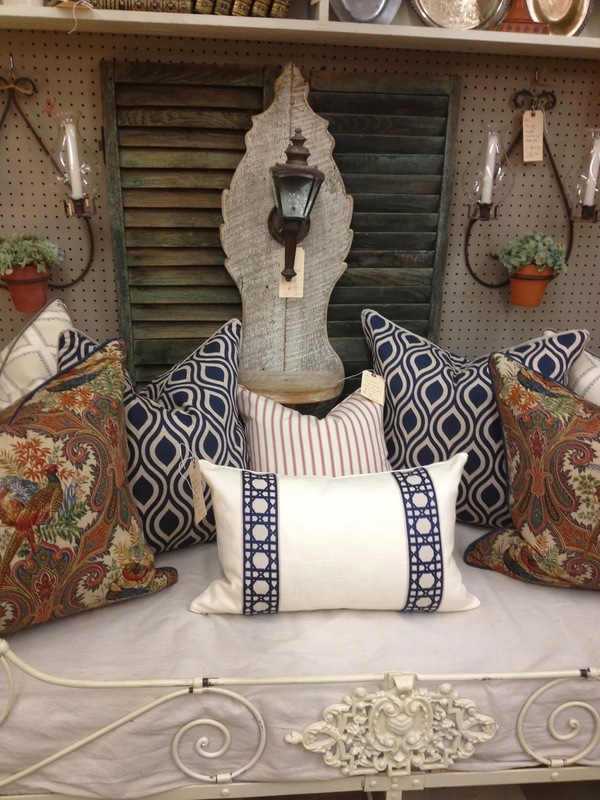 The above custom pillows in Sarah Richardson fabrics and ikat can be found in my booth at the Queen of Hearts, Alpharetta. Above, custom floral linen pillows and a grass green ticking cushion for an antique deacon's bench in a client's kitchen. I used these to style a photo shoot, but they ended up coming home with me...can't resist this blue! 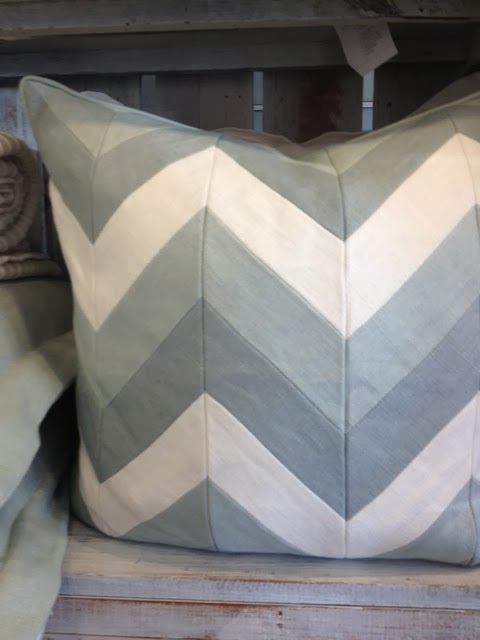 How fabulous is this pieced chevron in blue and white linen? 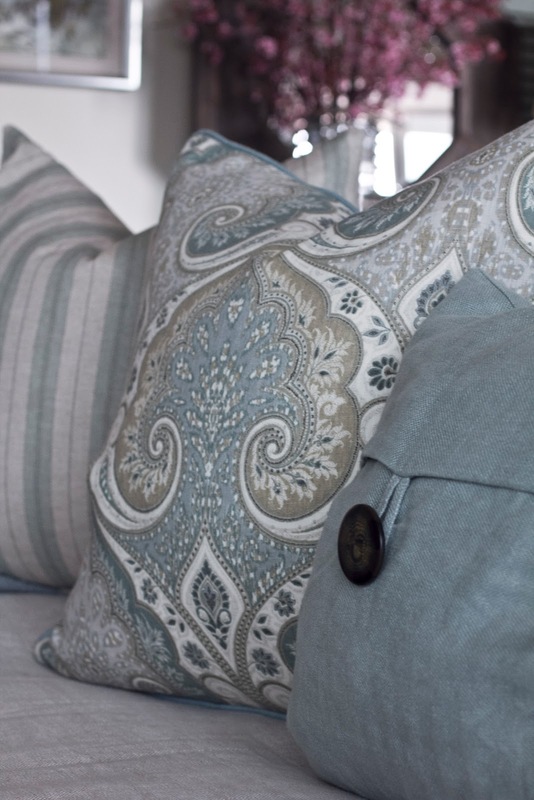 This velvet and linen beauty by Lacefield is still a favorite. The flame stitch in flame red and coral, combined with the crisp white basket weave linen and lattice trim is a showstopper! Here they are again, below, in a client's bedroom. 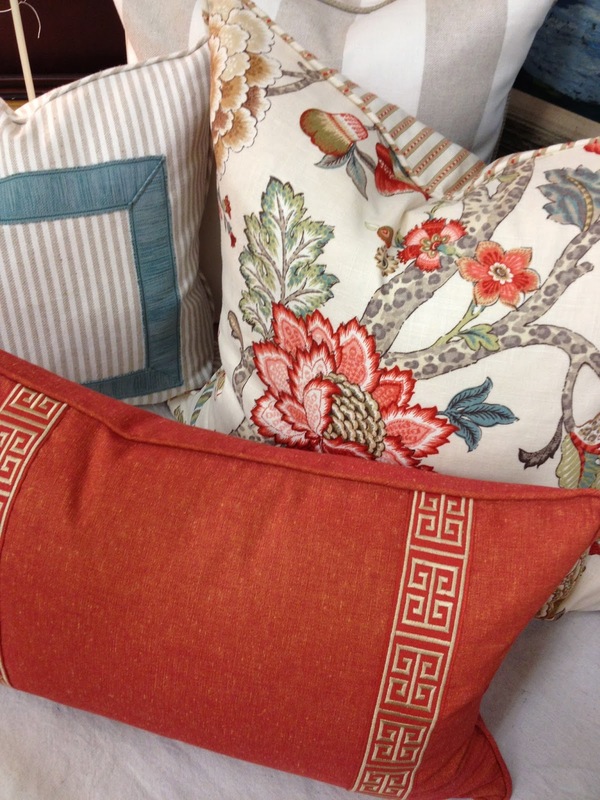 The above pillows are a combo of custom and Target. The grey plaid in the foreground was a Peacock Alley blanket from Tuesday Morning. We added the leather trim to give some masculinity to the space that functioned as an office and guest room. 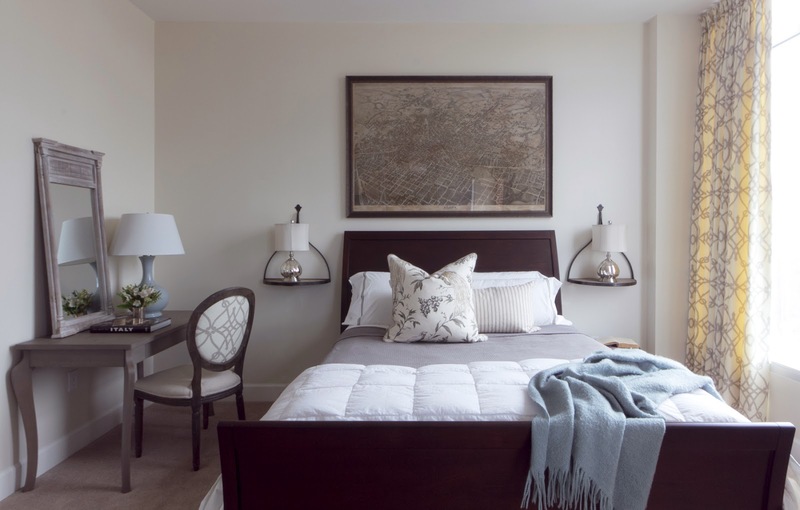 My daughter's room, below, has an antique French monogrammed pillow with polka dots and silver sequins from TJ Maxx for a clean, but cozy look. Window pane, ethnic print, and solids for the library below. 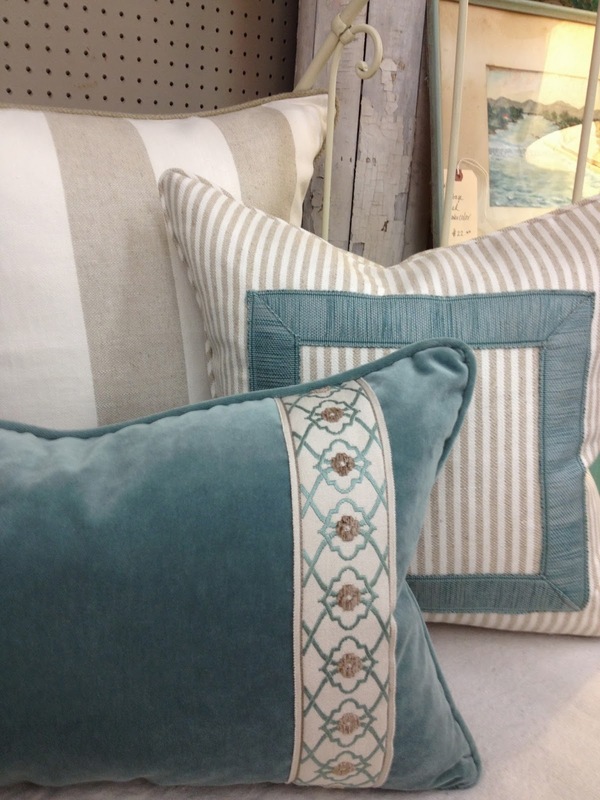 I covet these soft beach colors with a touch of animal found at Beau Interiors in Grayton Beach, FL. Look how the branches are animal print here...a subtle way to incorporate the print if you are not ready to commit to a lot of leapord. This was a Thanksgiving vignette that I did at the store....tapestry pheasants combined with modern navy tear drop. 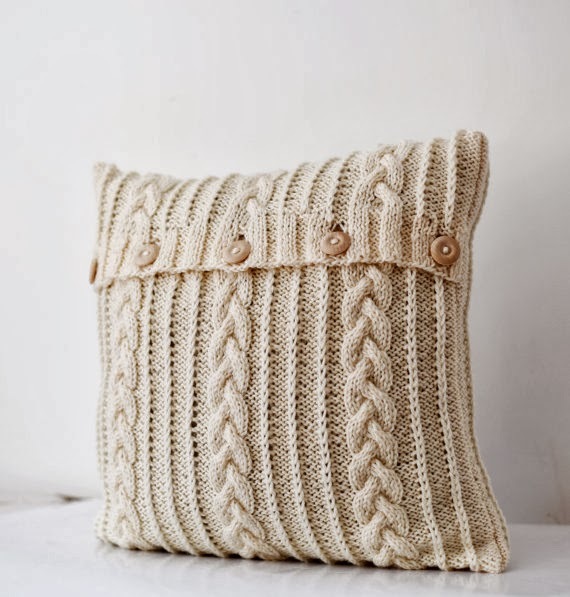 The above knit pillows were from Pottery Barn. The below beauties are hand knit in Lithuania by a little old lady, and available on Etsy. 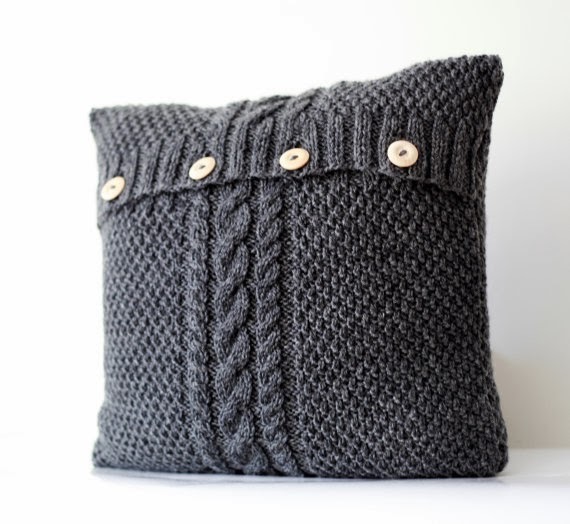 Here is another one in charcoal alpaca wool. Feel free to contact me if you are in need of a pillow makeover for your home, or if you would like quotes on anything you have seen here. Have a great week despite the snow from North to South! Lisa: What a wonderful post and I love the way you begin. Yes, I've tried to train my husband but it hasn't worked too well. Less is more around here and so be it! They just do not see the point, do they? Anyway, funny you should post this as my daughter(who lives in D.C.) and I were just searching for pillows yesterday, on line. She too (who is well trained, or it comes naturally?) is a pillow addict. Boyfriend not so much, so she has to tread carefully! They just bought a great new sofa so she's in the market for pillows and also coffee table. 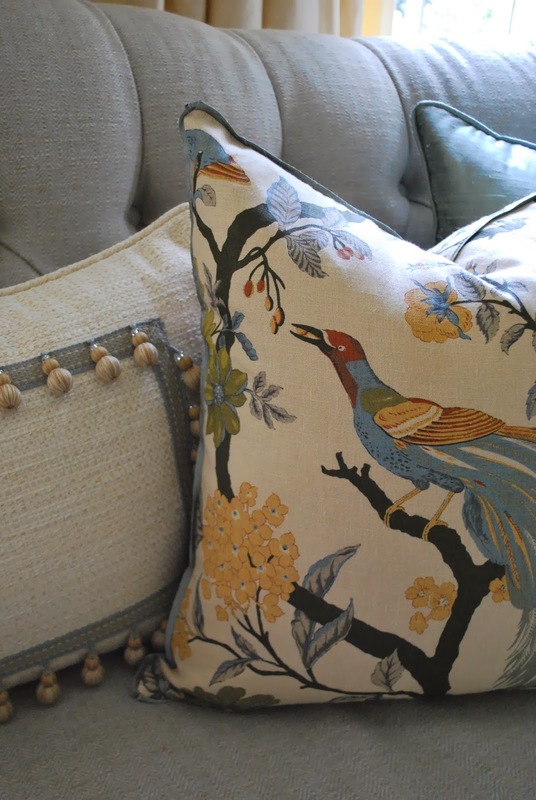 I just took two of the pillows that sit on my sofa, to my upholsterer who is adding more stuffing. And on and on…. thanks for the images and ideas here!